We have to give some thought to material conditions in relation to GDP. It is said GDP reflects standard of living which necessarily has to and does include material conditions that surround the people. The most common material conditions that influence people are generally house, job, health and safety. All these indicate the quality of life, of living. Let us first of all understand that quality of life is different from the standard of living. By quality of life, the general well-being of individuals and societies is primarily taken into consideration. 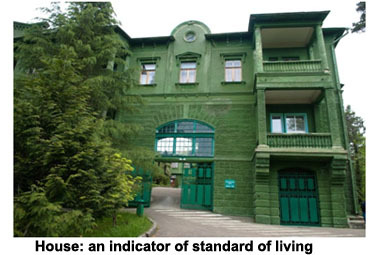 On the other hand, the concept of standard of living is predominantly focused on income only. The concept of quality of life is a complex one covering many facts of living like physical and mental health, living environment, and the time given to recreation and the leisure time; it does not stop there because of its comprehensive nature. It includes crime rate, and factors like freedom, and above all, happiness which is exclusively and subtly as well very subjective. 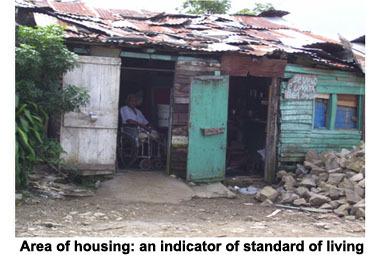 House is a major fact in assessing the quality of life, rather quality of living. House is accommodation. Man needs a place to live in being assured of safety and protection from all kinds of weather. He needs to make family and run it. House is a place for him to sleep and rest without which normal living will not be normal for long. It provides him with a keen sense of personal security and safety. Above all, house must satisfy him in all his basic needs so that house sweetens itself into home. Housing and housing costs go together. It means that one�s income decides the kind of house he can afford to build or buy. A rich man with massive disposable income can easily afford to go in for a very big house; it reflects his standard of living, discernible. A poor man may choose to live in a hut with no other possible option. It is his standard of living indicator. If the rich man has some sort of terminal illness that forces him to become bed-ridden as against a poor man in hut who labours endlessly and suffers from no such terminal illness, he can be said to have a better quality of living than the rich man lying down in bed in his sprawling resident. Three more facts are to be taken into consideration with regard to housing as an indicator of living, of material conditions: structural materials, inner facilities and neighborhood. The more money you have the better materials for housing you can easily access. Leave alone the area housing has taken up; the materials used to construct a house also yield to lots of varieties enabling choices. Both thatched roof and gold plated ceiling come under structural materials used in housing. Sky is the limit for the inner facilities if you have rolls of currencies at your disposal. Every item of inner structure has a wide range of varieties to meet equally a wide range of access to money. Neighbourhood is another vital aspect of housing. You may command a house in such an area where there is no pollution of any kind such as continuously noisy neighbours. We will continue this line of discussion dealing with GDP as an indicator of standard of living and quality of life.